I'm new here again but If I'm reading this right y'all are talking a exhaust damper on a WSM or the like. I too have seen them before in many variations for many types of cookers. As I've done temp control for 39 years, Not trying to rain on anyone's parade but air intake is the key, not exhaust. Simple thermodynamics. Heat rises over the meat. ATC's are cheap these days. Not sure where you got the idea the Adapt-a-Damper was being used at the exhaust? It goes on the intake of smokers. I too have seen exhaust setups in various designs, but I agree that air flow needs to be controlled at the input. Been lurking on this forum for years now. Finally pulled the trigger on HM. Also gave me a reason to buy a 3D printer. So this damper is the first thing being printed and is chugging along as I type. In the meantime, I was just curious what the preferred method of attachment is these days to a WSM 22". SS Dog bowl or Air burner? An air distribution pipe can probably.aid operation in some circumstances, but not without a few drawbacks as well. My 18 works fine with dog bowl. I put small deflector over hole on inside to help deflect air down and around sides. Good point. I can always move to an air burner if a dog bowl doesn't cut it. You likely will want a deflector on the inside. You don't want too much air to go upward and bypass the coals it will cool the smoker. A little this usually happens. My temple often drop by half a degree before it begins rising for this reason. The longer coals are shut down the more it will happen, they do not restart burning hot instantly. So if you reduce your temperature by 25 degrees, and it takes half an hour for it to cool off without the fan, the temperature is going to plummet when the fan restarts. An air distribution pipe would probably greatly help this situation. Last edited by MartinB; 02-13-2019 at 02:17 PM. 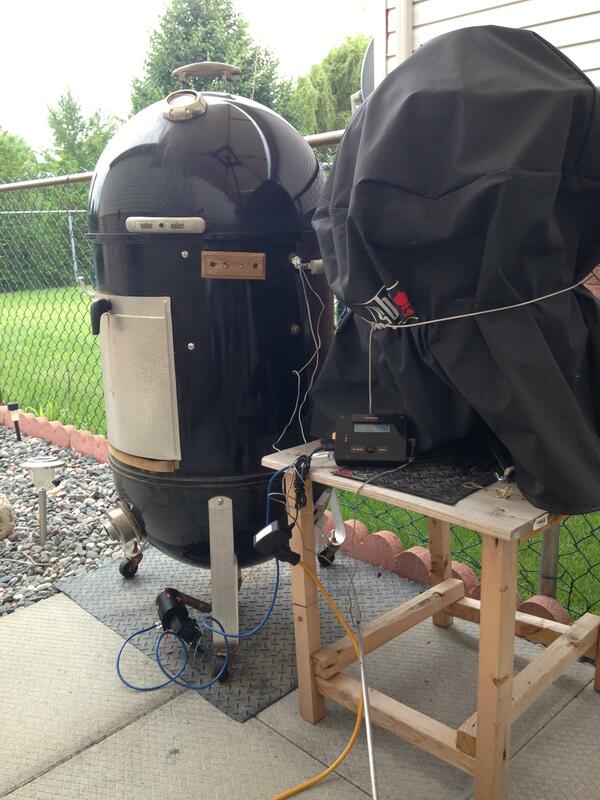 When I had my WSM 18", I used a DigiQ adapter. It has the deflector built in. I seldom had issues with burnouts, but as MartinB stated, it would occasionally indicate a drop in temp as a bit of the air bypassed the coals. What do you use for your connection to the damper? Also are you using 1" or 3/4" copper on the inside? Last edited by Dave Smith; 02-21-2019 at 01:36 PM.